Proper nutrition plays a multi-faceted role in your puppy's health, both now and as an adult dog. We suggest that you purchase a great quality dog food that lists meat as the first ingredient and does not contain by-products and is designed for large breed dogs. An excellent example of this is the Kirkland brand at Costco, that is also labeled by another company with higher prices. If you are using a different brand, it is important to blend the previous type and new type, lessening the previous type more each day, to ensure that your puppy doesn't get diarrhea. It is also necessary to ensure that you don't overfeed your puppy/adult dog, nor give it a high-fat/high protein content food which leads to obesity. Obesity can lead to growth spurts in young pups that put a strain on the developing joints and lead to hip dysplasia. Because your puppy is still a baby, it should receive age-appropriate exercise. They should be allowed to play or stop at will. They should not be encouraged to walk or run long distances or for long periods of time. Excessive leash walking, for example, can cause repetitive stress injuries to their developing joints and muscles and lead to hip dysplasia. It is very important to not let children play with the puppy unsupervised. Little children commonly accidentally drop puppies. Also, puppies have sharp teeth and are teething and may accidentally hurt children. Also, always supervise other pets with the puppy to watch for Alpha behaviors in other dogs that can injure you new puppy. Do not take the puppy out in public until 16 weeks of age and until it has received all its shots. We do not cover illnesses that your puppy can get from such outings. Diseases such as parvovirus can be life threatening to your new puppy. It is extremely contagious and can be found anywhere other dogs and their owners have been. We are confident the new owner wants only what's best for the puppy and dog and that a nice sized yard will be available for daily exercise. It is not mentally healthy for a dog to stay in a small yard, kennel or cable/rope day after day. This is physically unhealthy too. Those types of living conditions will cause the dog to become unhappy and may develop bad habits and emotional stress such as chewing its paws, etc. By agreeing to this contract you are assuring us that you will be providing a wonderful place for the dog to romp and play every day. When you bring your puppy home, it is very important that you introduce him/her to as many experiences as possible, especially before its 13th week. Sounds, sights, car rides, vet offices, people with hats, tall people, children, people carrying objects of odd sizes/shapes, bathing, blow drying, nail clipping, ear cleaning, walking surfaces, playing with other dogs and puppies, etc. Anything it experiences during its first 12 weeks will be considered "normal" for the rest of its life. Around 6-9 months the puppy will be going through its next phase when new experiences may be unsettling for your puppy, so extra attentiveness during that time is helpful to reassure your puppy that everything is fine. We've bathed your puppy at least once and used a blow drier to dry him/her. It is important that you clean the inside of the puppy's ears, being careful to not let water get into the ears which can cause ear infections. Use only cotton balls and rubbing alcohol to wipe them clean. We've had fun beginning the process of socialization training and it's important that you keep it up. Help your puppy feel safe and comfortable with each new experience and complete this training, and have fun! Your new puppy has been given its first set of regular vaccines, raised with quality dog food, and given lots of tender loving care from the moment of birth to ensure healthy socialization and confidence. We guarantee the dog to be free of any serious genetic/hereditary defects that may seriously affect the life and health of your dog for 1 year. 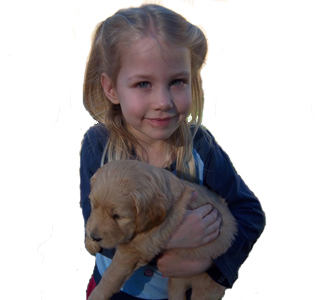 We require you take your puppy to your own personal veterinarian within the first ten days of bringing him/her home to confirm the good health of your new puppy. If the veterinarian discovers a genetic or hereditary defect that will seriously alter the life and health of your new puppy, we will gladly refund up to the full purchase price, or the cost of the surgery, not exceeding the purchase price. Any concerns about joints MUST be confirmed by OFA or Penn Hip to be refunded. All veterinarian costs are the responsibility of the buyer. By signing this Purchase Agreement you are confirming that you understand that the appearance/fur type/personality/size of your dog can not be predicted nor guaranteed by the seller. Also, we do not claim to have hypo-allergenic puppies. I agree to this Purchase Agreement/Health Guarantee. Website © Copyright TLCGoldendoodles 2016, All rights reserved.